Former prime minister and now Moresby North West elected MP, Sir Mekere Morauta, says there will be an inquiry into government systems if he's in government. 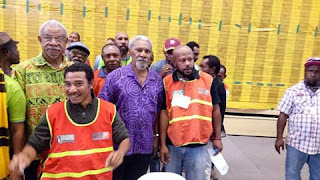 Making his speech following his declaration just minutes ago at the Rita Flynn Courts in Port Moresby, Sir Mekere made particular reference to the electoral system, describing it as sick and needs a complete overhaul. "The counting officials, the assistant returning officers, you have worked very very hard. "While I wasn't here, I could feel the pain and the frustrations. "With all the respect to Rita Flynn, if I had the chance to rename the this building I will call it the "house of toture". "It has been a torture, and the system should not treat people like this. "What is happening here is a clear sign that we have a sick system and we need to correct it. "In merely five years from 2012 to now, the system has broken down. "Its man-handled, manipulated by evil people and we should not allow this to happen. "When we are in government we will have a commission of inquiry. "This is because the system does not work. It denies the people who own this country, their right to speak, their right to choose, and those are important fundamental democratic rights that we have to protect. "I've never had an experience like this in my public life. "This has been the most frustrating, dispiriting experience and I don't want to go through this again." Sir Mekere polled 14,007 votes past the absolute majority of 12,918 votes at the 35th and last elimination at around 9 o'clock this morning to be declared the winner.